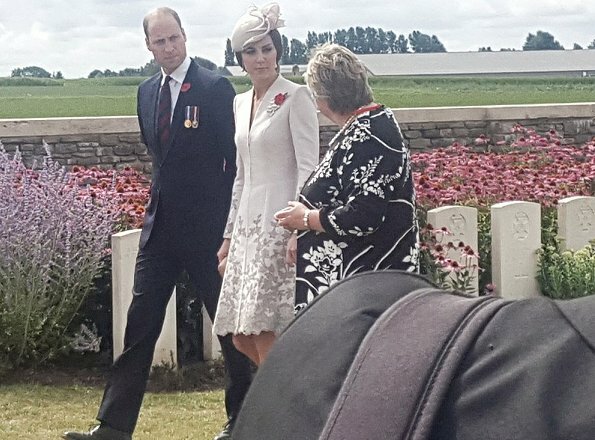 Prince William and Duchess Catherine of Cambridge visited Commonwealth War Graves Commission Cemetery Bedford House on the outskirts of Ypres in Belgium. I liked yesterday's well-cut white outfit better than this one. Dress is all right, grey floral detail is pretty, but I wish she had worn the gray heels. Hat looks oddly squished onto her head. 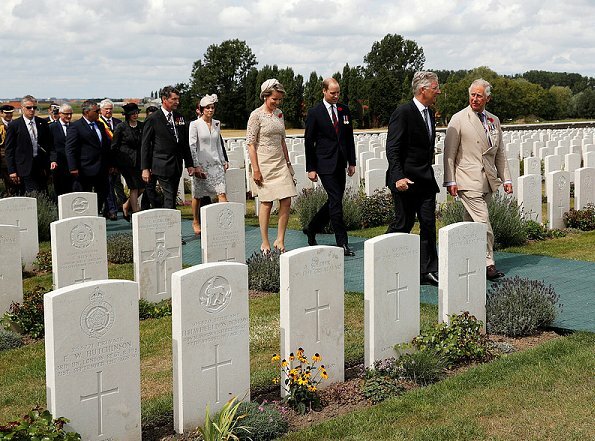 Catherine lost a significant part of her family in WWI (multiple Middleton uncles; wonder why that is never mentioned). Perhaps because the occasion never came up until this commemoration. After all, and I don't mean this unkindly, Catherine was an unknown before she met and married William. That's true. But the wedding was in 2011 and I think some balance about her background would be fair. 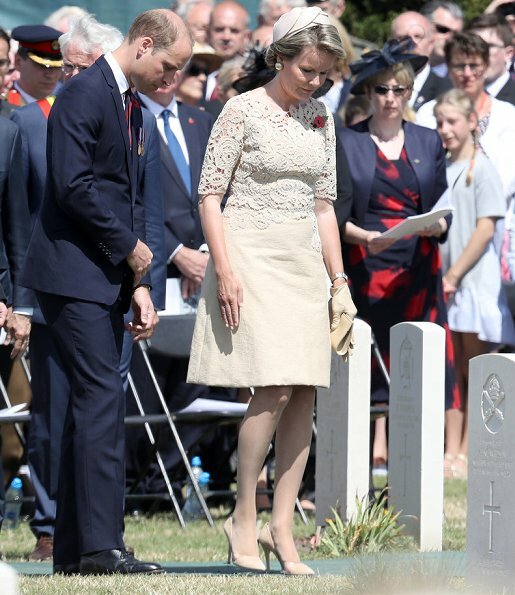 The only reason I know about Middleton sacrifices in WWI is because I read a book that contrasted what Catherine's family was doing through history with what William's family was doing at the same times. It was fascinating. 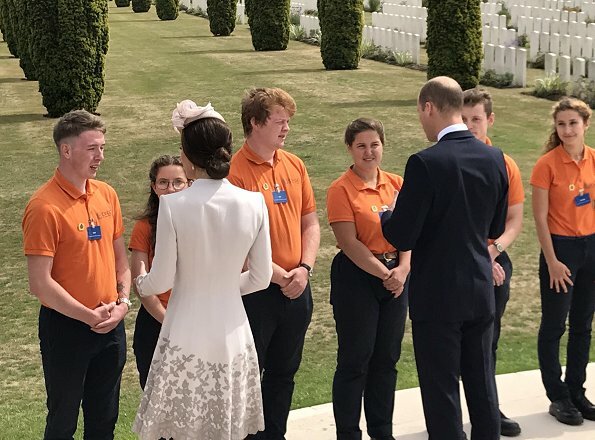 The media goes on and on about Carole Goldsmith's family being coal miners... but that is far from the whole story of Catherine's ancestors on the Middleton side. 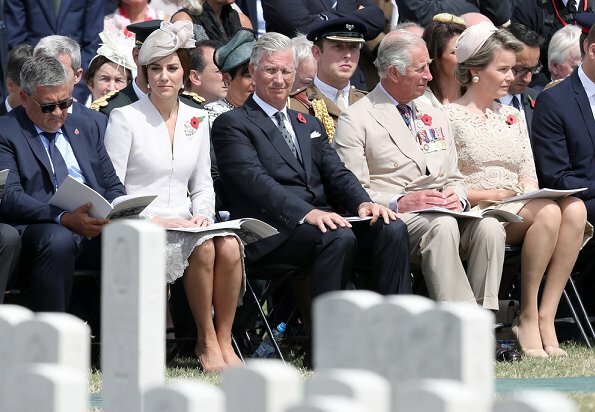 I like Catherine's outfit today as well, I do like her poppy brooch arrangement and the muted flower pattern. I'm less keen on the Queen's dress today - the waist sits a bit high for my taste and it looks creased. I do like the pale gold beige colour and detail on the bodice. The dress detail makes me think of a field of wildflowers (without the color). Imagine all of those men firing across fields that once were beautiful and vibrant with crops and waving grasses. So sad. What was Mathilde thinking? That dress is awful, unbecoming and ill fitted. It is Timothy Lawrence. He attended. It is Timothy Lawrence - he is high up in the War Graves Commission and he is always at these commemorations. I think that Kate's dress would have looked so much better with buttons instead of that zipper. Totally at odds with the delicate lace appliquée and the overall classic design. I know this designer has something of a propensity to pair us zippers with elegant lace coat-dresses, but this one particularly strikes me as a bad choice. For me it takes away the overall feel I get when looking at the pictures. Too bad - otherwise a good fit on Kate. 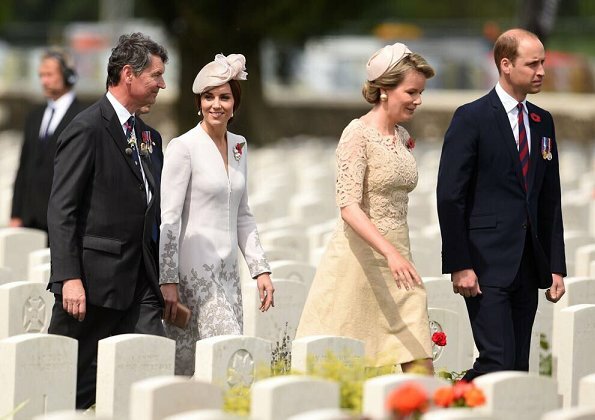 Kate cannot hold a candle to the European and most of the Scandinavian royalty. She always looks insecure. Cannot stand the hands over the stomach/abdomen. Mathilde has class. Another rude comment, which has no place here. I don't think Catherine lacks class. She looks relaxed and confident to me in these pics and there are barely any of her with hands in front of her stomach here. I don't see why it has to be a competition - they all have their good and not so good points. Mathilde does have class but today she apparently doesn't have an iron. LOL on the iron! 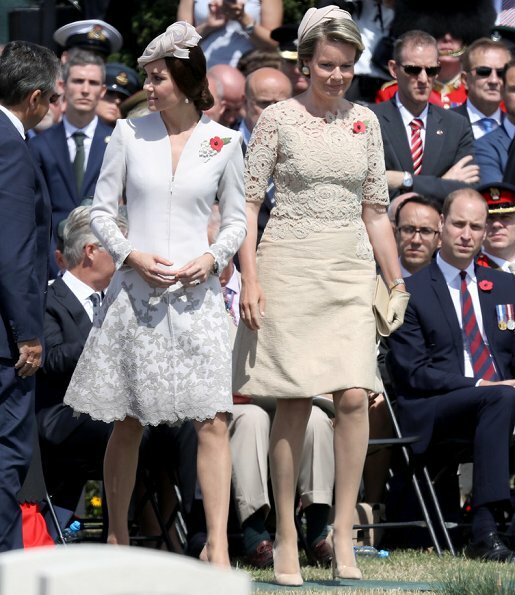 Catherine has some class but bad posture and this ruins the impression she imparts. Sitting and standing up straight is stressed amid most of the upper class. Good posture creates an impression of poise, ease, and belonging. 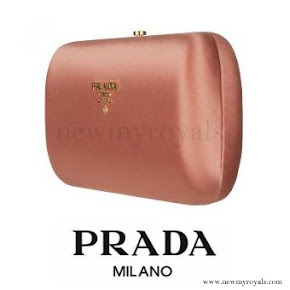 Hunching shoulders and clutching comfort objects (like the aptly named "clutch") does not. Catherine Walker clothes sometimes don't impress me in pictures when worn by a model. But to see pictures of the Duchess in action, wow! The superb craftsmanship and couture lines are a work of art. Both today's outfit and that of yesterday's are Walker creations I believe. We all know Catherine has some beautiful grey pumps in her luggage. Why did she not wear them with this dress?? I am not a fan of this coat dress. The V-neck looks kind of harsh with the zipper and is not flattering. I also don't like the updo of her hair here and the fascinator - well, I almost never like them. I think a small hat in silver grey, matching the applications of the dress could have worked. And Mathilde - yesterday she lookes like a divine Diva and today - although the light gold color is nice - her dress is a mess. Once again it is too short, too tight over the stomach, and once again the waist too high. A crinkled skirt and even worse a wrinkled up hem with visible stitches...Seriously? Who is the designer? wished she would wear yesterday's shoes for today's outfit. the earrings would also work well too with tommorrow's outfit gosh. 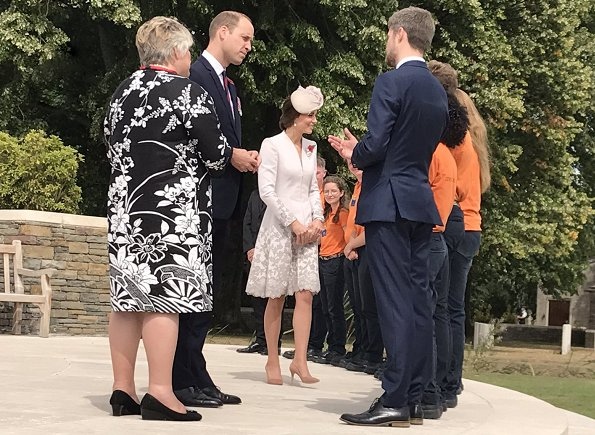 Kate is wonderful in this coatdress, such a pitty that she didn't put on her yesterday's gray shoes, it would be a perfection in that case. Mathilde's dress is nice too but not on her - it's again too small in a upper part and so it sits odd on her. Luckily she is naturaly graceful and elegant so a little bit she takes away attraction from bad clothes choice but it's a pitty. Elegant ladies/royals, and men as well. Least we not forget! 100 yrs. Those many who died in service/for our freedom. An honouring ceremony attended by many relatives. Well televised/good coverage/news. Kate looks elegant here. I like the bit of edge that the zipper adds to the lace effect. I do agree that the shoes would have been far better in grey. Mathilde - this is a dress that would have looked good on the hanger. I don't understand that her advisors aren't more careful in checking that the design and fabric of her clothes will not show obvious creasing.